I am so excited to share with you all that I am now a VITAMIX AFFILIATE! Yay! I couldn’t be happier to be working with a company I whole heartedly believe in. So if you are in the market for a Vitamix, I am your lady! What does becoming an affiliate mean? It means that when you use the code below when placing an order it will entitle you to FREE standard shipping and handling ($25US/$35CN value) and also will support me as I will receive a commission. I will only represent companies that I believe in, trust and most importantly, actually use! I have owned one for the past 2 years and couldn’t live a day without it! If you would like to support me, you can purchase your Vitamix by clicking on the link below. Please don’t forget that I won’t get compensation if you don’t enter my code. Please share my affiliate code with anyone you know who is looking or considering purchasing a Vitamix, I would truly appreciate it! I have been working extremely hard on my blog and Facebook Page over the last couple of years, and love sharing my journey, recipes, articles, motivation and anything else I can get my hands on with my followers, that I have decided to jump on board with Vitamix, and continue my journey on the health and fitness path. I would eventually like to branch out into personal training and other outlets in helping me to create a small profit for myself, but I am going to take it one step at a time, and keep doing what I am doing, because well….. I LOVE IT! Thank you to all my followers and supporters who have been with my from the beginning to those who have joined me since then! I appreciate each and every one of you. I hope you continue to enjoy my blog and Facebook Page, and follow me along the rest of my journey. But now, here’s a little word about my favorite blender! 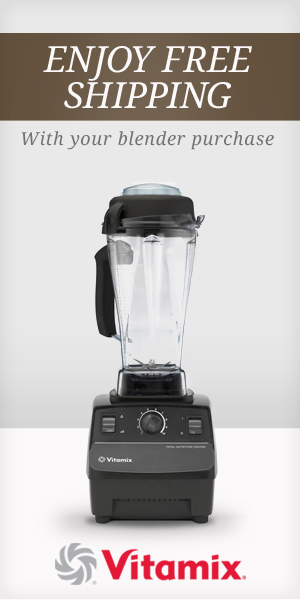 The Vitamix is an extremely powerful blender and can do just about anything! The Vitamix can make chop, churn, make creamy smoothies, soups, juices, dips & spreads, frozen desserts, dressings, batters, flours, purees, dough, milks, whip cream, nut butters butter, baby food, and more. It is capable of even heating foods! I know these blenders are more pricy then your regular blender but they replace SO many appliances in your kitchen, make living a healthy lifestyle so much easier, and after using one you will understand why. It took a while to persuade my husband into purchasing one, but he even agrees that he couldn’t go a day without ours! If you have any questions, please let me know if I can help! I love this! Best blender EVER! It replaces many meals for me and save me tons of time in the dreaded kitchen.